Galerie Allard, Paris (acquired from the artist). Mme Ozil, Paris (by descent). Galerie Durand-Ruel, Paris and New York. Mr. and Mrs. Edward G. Robinson, Beverly Hills (acquired from the above in 1960). Jane Robinson, Beverly Hills (circa 1972). D. Rouart, J.-D. Rey and R. Maillard, Monet, Nymphas ou Les miroirs du temps, Paris, 1972, p. 169 (illustrated). J. Robinson, Edward G. Robinson's World of Art, New York, 1975, p. 28 (illustrated in color, p. 29). D. Wildenstein, Claude Monet, Biographie et Catalogue raisonn, Lausanne, 1985, vol. IV (Nos. 1596-1983 et Les Grandes Dcorations), pp. 280-281, no. 1866 (illustrated, p. 281). D. Wildenstein, Claude Monet Catalogue raisonn, Cologne, 1996, vol. IV (Nos. 1596-1983 et Les Grandes Dcorations), p. 885, no. 1866 (illustrated in color, p. 884). New York, The Museum of Modern Art, and Los Angeles, The County Museum of Art, Claude Monet: Seasons and Moments, March-May 1960, p. 63, no. 110. Tokyo, Galerie des Arts, Monet, Renoir, Bonnard, August-September 1979, no. 17. Tokyo, Seibu Museum of Art, Monet, 1981, no. 21. Tokyo, National Museum of Western Art, and Kyoto, National Museum of Modern Art, Monet, December 1982-January 1983, no. 59 (illustrated in color). Basel, Kunstmuseum, Claude Monet: Nymphas, Impression, Vision, July-October 1986, pp. 77-78, no. 40 (illustrated in color, p. 78). house at Giverny (fig. 1), were the last serial undertaking of his life, and they represent some of his most free and profound explorations of nature and art. Monet moved to Giverny in 1883 when it was a small town of 279 inhabitants. Initially he rented a house, but when the opportunity arose in 1890, he bought the property for 22,000 francs, "certain of never finding a better situation or more beautiful countryside," as he wrote to his friend and dealer Paul Durand-Ruel. Upon purchasing the house, he immediately began tearing up its grounds in order to replace the kitchen garden with a flower garden. All his life, Claude Monet had been a passionate gardener, but never before had he enjoyed the means to fulfill this passion completely. 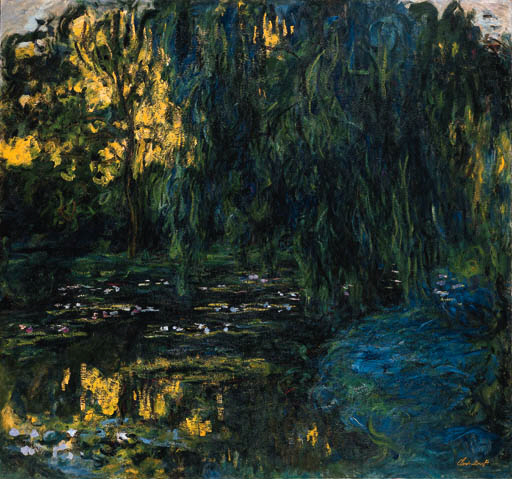 In 1893, when the property adjacent to and below his land went up for sale, Monet immediately purchased it and applied to the local government "to install a prise d'eau in order to provide enough water to refresh the pond that I am going to dig on the land that I own, for the purpose of cultivating aquatic plants." Although his plans involved diverting the Seine--and despite initial resistance from the other residents of Giverny--construction went quickly, and by the fall Monet had converted nearly 1,000 square meters into a lily-pond ringed by a variety of flowers, trees and bushes. He continued to improve and add to the garden throughout the rest of his life, especially in expansions in 1901 and 1910. Monet thought of his water garden as eastern in character, especially in comparison with the more traditional, western flower garden by the house. He accented this feature by building a foot-bridge in Japanese style, and by planting bamboo, ginkgo trees, and Japanese fruit trees around the pond. You enter the aquatic garden over an arched bridge covered with wisteria in June--the fragrance is so heavy that it is like going through a pipe of vanilla. The clusters of white and mauve...fall like fanciful grapes in the water, and the passing breeze harvests the aroma (quoted in R. Gordon and A. Forge, Monet, New York, 1988, p. 213). Though the effect from the outside is dazzling enough, the sensation on entering is even more intense, even more surprising... There is no rest for the flowers of the garden at Giverny. Everywhere you turn, at your feet, over your head, at chest height, are pools, festoons, hedges of flowers, their harmonies at once spontaneous and designed and renewed at every season (A. Alexandre, quoted in C. Stuckey, Monet, A Retrospective, New York, 1985, p. 220). Every known variety of water lily was planted in the pond. Beginning in June this reflecting mirror, shaded by willows, framed by tall aspen, covered with flowers of every color, becomes the very magic of the Giverny gardens... There are abundant irises of all varieties along the edges of the pond. In the spring there are Iris siberica and virginica with their long, velvety petals; later Japanese iris (Iris kaempferi) abound and impart an oriental touch, which is further enhanced by such plants as Japanese tree peonies (quoted in ibid., p. 314). The colors of the floating lilies, the sprouts of the bamboo, the undulations of the willow branches were his to determine, so that they could present him with the pictorial elements he desired. Indeed, the waterlily pond was built especially to provide Monet with an endless series of subjects which, with all but obsessional single-mindedness, he devoted the rest of his life (J. Rewald, The Gardens at Giverny, New York, 1983, pp. 9-10). I have painted so many of these water lilies, always shifting my vantage point, changing the motif according to the seasons of the year and then according to the different effects of light the seasons create as they change. And, of course, the effect does change, constantly, not only from one season to another, but from one minute to the next as well... To make anything at all out of all this constant change you have to have five or six canvases on which to work at the same time, and you have to move from one to the other, turning back hastily to the first as soon as the interrupted effect reappears (quoted in C. Stuckey, op. cit., p. 290). From 1916 through 1919, Monet produced a series of paintings which focused on three weeping willow trees that stood at the southwest and northern ends of his vast water garden. The present painting depicts the largest of the three willows which was the model for a group of pictures that focused primarily on the tree's trunk and its sea of overhanging branches (see fig. 2). It seems that Monet began working on the weeping willow series in the middle of World War I when the Germans had mounted their most aggressive attack against France. Monet explained to his friend Gustave Geffroy, "Painting is still the best way not to think too much about the sad state of affairs although I am slightly embarrassed to think about little researches into form and color while so many people suffer and die for us" (quoted in, P.H. Tucker, Claude Monet, Life and Art, New Haven, 1995, p. 205). Deeply affected by the war, the weeping willow represented a poetic symbol for Monet, one which he used to express his heart-felt despair and hope that the event would soon be over. He fused lyricism and realism in his depictions of the mammoth tree, causing the very shape of the object to melt away in modulations of color. He wrote to the Bernheim-Jeune brothers in February 1915, "I mix and use a great deal of color. It occupies me enough so that I do not have to think too much about this terrible, hideous war" (quoted in ibid., p. 205). The present work immerses the spectator into a fantastical world of water, brilliant color, and wonderfully lush foliage. When Monet painted this series, he was in his late seventies and had been painting for over sixty years. Like Titian and Goya--two other great painters who enjoyed long and productive lives late in their careers--Monet painted works of ravishing beauty whose technical and descriptive freedom constitutes a late style distinct from that of his earlier years. The distinguishing characteristics of Monet's late work are long, sinuous brushstrokes--often of unmodulated color--which are applied in so loose a fashion that outlines are blurred and form is dissolved in light and color. These characteristics are evident in the present picture, for example, in the long green strokes which form the canopy of overhanging foliage. The sublime painterliness of Monet's late style is one of the greatest achievements in twentieth-century art, anticipating and superceding much of Abstract Expressionist painting. Throughout his career, Monet created the impression of instantaneous effects by elaborately working his canvases, building up many layers of paint which often crest in thick passages of impasto. While impasto had been a common painting technique since the sixteenth century, no artist before Monet had used it in such a rich fashion; and Monet's freedom of application increased as he grew older, with the impasto rising to an unprecedented height late in his life. (fig. 1) Monet at Giverny. (fig. 2) Claude Monet, Saule pleureur et bassin aux nymphas, 1916-1919. (fig. 3) Monet's water-pond at Giverny, circa 1933. Country Life Magazine Collection, London.